Burcu Akyol is an amazing professional and person in Istanbul, Turkey. Anyone who is active on social media (and not only) knows her for her professionalism, fantastic and widely-known educational conferences she organises and wonderful smile and character! Burcu tagged me in her Eleven post and I decided to expand on one of her questions and turn it into a blog post. 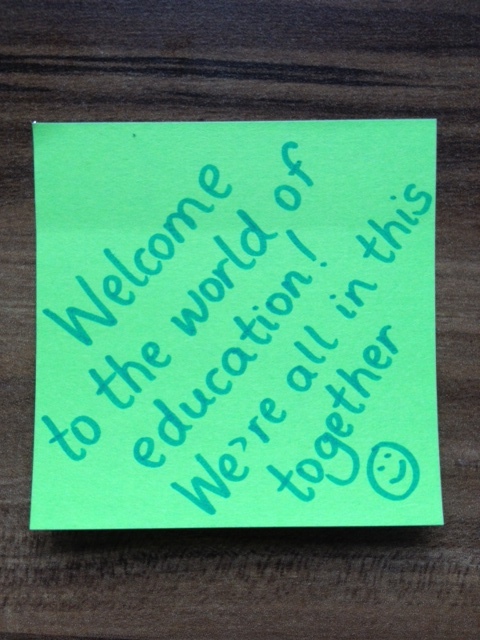 Burcu’s question was: What would your advice be to a new teacher? I have been teaching for almost seventeen years. The beauty of our profession is that we keep on learning practically every day, and every beginning of the school year feels like the first time. I read somewhere that it is one of the few professions where we can start again from the beginning, every year : ) If I could give some advice to new teachers, first of all I would give them a huge welcome to this wonderful field. Welcome and we are all in this together. It is a great field, which can give so much happiness, but disappointment occasionally as well. Use this disappointment to improve on and reflect. It really is okay to admit you do not know something, or have made a mistake. It took me a couple of years to realise it, but the students are mostly understanding and really appreciate it. It is absolutely essential, and to the benefit of both yourself as an educator, and to your students as well and above all, to continue developing professionally. It doesn’t need to be endless hours consumed in sessions or giving up altogether on sleep. Connect with other educators on social media – and there are lots out there to help, support and motivate you. And you can do the same for them! And it can be as little as 5 minutes interaction per day. Believe me, once you start it, you will love it! You can go to my series of blog posts on how to start, either online, offline or both. Reflect on what went well – it is so important, as we mainly tend to focus on where we didn’t do so well. Both in balance are great to do – reflection on good points helps in keeping it up, and reflection on negative aspects helps bring on improvement. Welcome and wish you a great new beginning! Special message: Since we are on the topic of new, I would like to tag Vicky Papageorgiou, a new blogger, to start the Eleven blogging challenge!